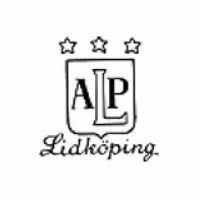 I would like to thank Sten-Åke Svensson for the background information and pictures regarding the AB Lidköpings Porslinsfabrik which greatly helped me putting together this page. It was a great pleasure working with him and it was an honour to provide him with some information on the German subsidiary and the chemical aspects of porcelain production. 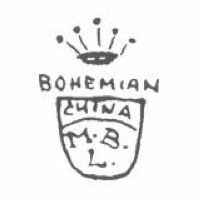 Of course I would also like to wish him the best of luck for the book he is writing on the Lidköpings Porslinsfabrik, a valuable resource not only for collectors of ALP porcelain. As they say in Sweden: "Lycka till!" The factory was founded in 1874 by the brothers Christian and Gustav Martin in Lubau (today Hlubany) which belonged to the district of Podersam (today Podbořany). They mainly produced all kinds of household utility wares starting with normal tableware up to wall pockets, cutting boards and even rolling pins. The business was very successful even if it is not very well known outside their area of operation as they only produced for the surrounding market. In the year 1900 they employed around 70 people which was already quite an impressive number for an otherwise relatively unknown company, but the business constantly expanded and in 1913 the facility employed 250 workers. This drastic rise in numbers was not only was based on the production increase now mainly for export but also resulted from the company now having their own kaolin pits which were used to also supply other manufacturers. Their product range had also improved, now offering various decoration styles like brocade and cobalt blue as well as the so-called 'Indisch Blau' decoration which was either applied via single stamps or with a rubber matrix and based on the originally handpainted Meissen 'Strohblume' type. In 1900 P.R. 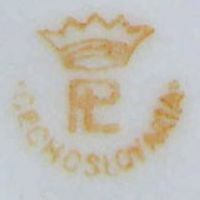 Nyman from Lidköping (Sweden) started to import white porcelain from different German factories like Rosenthal in Selb (Bavaria) and resold the items decorated in his studio. 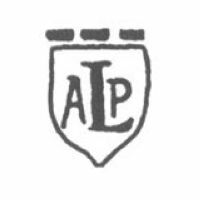 After a few years and with many long-term customers at hand, he decided to create his own items and therefore in 1911 founded the AB Lidköpings Porslinsfabrik or 'ALP' for short. The business was such a success that in 1913 he shut down the pure decoration business, enabling him to fully concentrate on production. Most people in Germany or the US can't associate anything with this name, it might help to know that later on - after a merger in 1929 and the completed facility move in 1936 - it became the facility of the perhaps better known Rörstrand company. Anyway, even if the country of Sweden has its own kaolin deposits the type needed by Nyman to produce hard paste porcelain had to be imported. The reason for this was that the chemical structure varies depending on the location of the deposits and these must include different amounts of additional elements as they are vital for the process - for example, clay and kaolin must each contain more than five percent foreign oxides (mainly iron, magnesium, potassium, sodium and calcium). As mentioned, this specific mixture was not available in Sweden and so at first German kaolin was used. Nyman of course had various other sources, for instance the company of Zettlitz Kaolin (founded 1892) located in Zettlitz near Karlsbad in Austria (today Sedlec near Karlovy Vary in the Czech Republic). The Zettlitz deposits were of excellent quality which of course was the reason for the high prices demanded on the market. After various tests Nyman found the perfect kaolin source to fit into his production: the deposits from the Podersam district were very similar to those from Zettlitz and could also be used for electro-technical porcelain (e.g. insulators) which required a special mixture of components because normal porcelain becomes too brittle when exposed to high voltages. By using the kaolin from the Podersam area he was able to make two totally different kinds of porcelain while using one set of raw materials - he only needed to add calcined bauxite (also available in Sweden) to receive a perfect mixture for electro-technical porcelain. The economic background for this was of course that avoiding two different stocks with different storage facilities not only saved lots of money but also allowed the firm to easily adapt to changes in demand. Since 1914 both Germany and Austria were allied forces in the WWI (1914-1918) conflict and even if Sweden was neutral one can imagine how hard it must have been to build up a business relationship. Actually organizing transport was not the problem as ships were constantly travelling between Sweden and Germany based on shipments regarding (next to other goods) the Swedish Tungsten steel needed for the war effort. If we leave all that aside, some of the actual proceedings remain a mystery even if there is enough proof that plans for the takeover of the Gebrüder Martin factory in Lubau were discussed at the ALP facility during meetings in June/July 1917. It seems that Nyman (even if he still owned the majority in shares) had problems with a few members from the board of directors which objected to some of his ideas. Fact is that Nyman had a silent business partner not present in the board ever since he had started his business career and perhaps as to prevent further complications or to actually achieve a better position in or for negotiations, Nyman and his silent partner travelled to the Podersam district. It appears that not all of the directors were previously informed about this trip as there are no official protocols which show a discussion of this matter; Nymann only seems to have inofficially informed a few beforehand, perhaps as to reassure himself that he had some support. Anyway, the confusion really starts as the documents dealing with the purchase were signed by Nyman together with his silent partner as normal private persons and not as representatives of the ALP company. As there were no restrictions regarding foreign investors or companies taking over a local business, there must have been other reasons for this procedure. 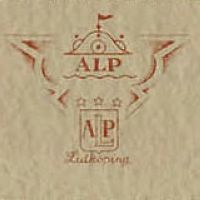 Next to one theory regarding the possibility of not being able to supply some documents allowing them to represent the company there is another theory based on the type of payment as the ALP company perhaps did not have the large amount of free cash while Nyman and his silent partner could have been able to provide the amount needed. Even if we will probably never know the true reason the privately owned business was then sold to ALP Sweden by Nyman and his partner (October 10th), renamed accordingly and officially registered under the new name only a few days later on October 19th 1917. Needless to say, both Nyman and his partner seem to have made some amount of profit through the sale. 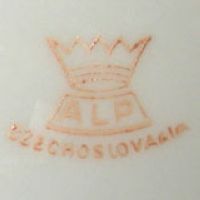 During the following years the facility not only supplied the ALP main facility in Sweden with kaolin for their production but also ensured a constant supply of undecorated blanks for decoration. On top of that the Lubau business continued to serve the market that the Gebrüder Martin had successfully supplied for such a long time, adding to the growth of the mother company. 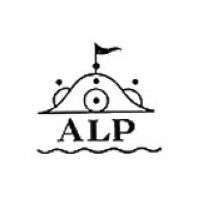 As an interesting side note it should be mentioned that during the period the facility was run by ALP, saucers received a company mark while the cups were left blank just like the original products made by ALP in Sweden. 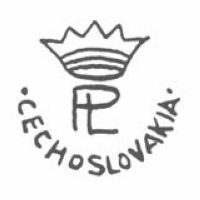 After the war the export of kaolin from the newly founded state of Czechoslovakia became more difficult based on new export laws which added to the decision to restructure the business and concentrate more on the main production location. Therefore the Lubau facility was sold to the J. Dengler & Co. company from Fischern (today Rybáre) on July 21st 1921 with part of the deal being a kaolin and blanks delivery contract with ALP in Sweden and the right to continue business under the same name as before, quite a common procedure at that time. 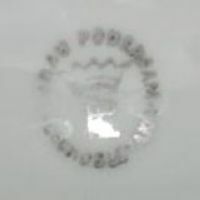 It should be mentioned here that even though the long company name introduced by ALP Sweden was used until the factory closed there are also examples of a much shorter company name used at the same time when trading either finished items or blanks, in those cases the name of Porzellanfabrik Lubau, J. Dengler & Co. was used, a designation which also was the basis for the 'PL' mark. Under the new management the facility slowly managed to expand even more and official records show a peak number of 500 employees in the year 1930, but from around 1934 onwards many wrong decisions regarding the product range and the first prewar changes in Germany (their largest market) resulted in a decline in orders. This finally forced Dengler to let off workers which resulted in an official count of 300 employees in 1937 and a drastic cutback in the range of products. Nearly a year before the official declaration of war, German troops occupied the Podersam district between October 1st and 10th 1938. On November 21st 1938 the area was officially declared part of the German Reich (it belonged to the so-called 'Sudetendeutschen Gebiete' or 'Sudetenland') and received the former Austrian name of Podersam. Even if the German market now was freely accessible, the company was still fighting for survival. In the hope of perhaps receiving new ideas and a constant supply in larger orders the company merged into the EPIAG group in 1939, but the years of neglect to the machinery and kilns made it nearly impossible to react when business started to increase. It came even worse as the war made keeping up the workforce and securing funds more and more difficult, thus adding to the problems the company had anyway. After losing a contract because the delivered samples were not only a week late but also of insufficient quality, the company had to file for bankruptcy in 1941 and as the business was not relevant to the war effort, it was closed the same year. 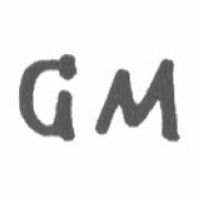 One of the first marks, 'GM' for Gebrüder Martin. 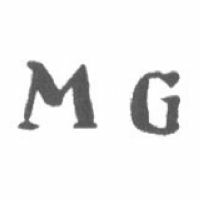 One of the first marks, here 'MG' for Martin, Gebrüder. No date known, 'MBL' stands for Martin-Brüder Lubau. Used between 1918 and 1921. 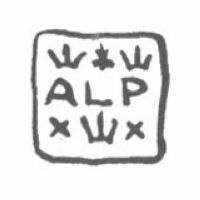 [Reference] Swedish ALP mark, around 1926. [Reference] Both original Swedish ALP marks on a catalog. 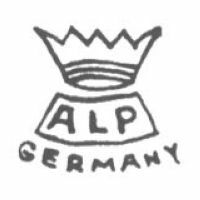 [Reference] A third Swedish ALP mark, just added for completeness. 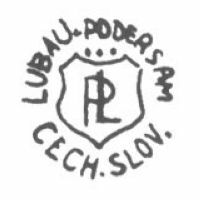 Used between 1921 and 1938, earlier version with 'LUBAU PODERSAM' over 'CECH.SLOV.'. 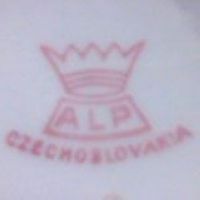 Used between 1921 and 1938, later version with 'LUBAU PODERSAM' over 'CZECHOSLOVAKIA'. Used between 1921 and 1938, the final and most common version of these Podersam marks. Used between 1921 and 1938, here in red. Note the similarity with the marks used by Pfeiffer & Löwenstein from Schlackenwerth. Used only between October or November 1938 and August 1939. The later 'CZECHOSLOVAKIA' version in light red. And the 'CZECHOSLOVAKIA' version in dark red.